As I worshiped in the Holy Spirit of El יהוה / Yahweh . AND WE ARE HIS WITNESSES OF THESE THINGS, AND SO IS ALSO THE HOLY GHOST, WHOM El יהוה / Yahweh HATH GIVEN TO THEM THAT OBEY HIM! I was baptized with the Holy Spirit of El יהוה / Yahweh by speaking in tongues on September 20, 1994. Since that time I daily delight to pray and sing in the Holy Spirit. It is like a heavenly river is flowing inside of you. … The Messiah El יהוה / Yahweh promised to give His holy spirit to those who follow Him! Amen. 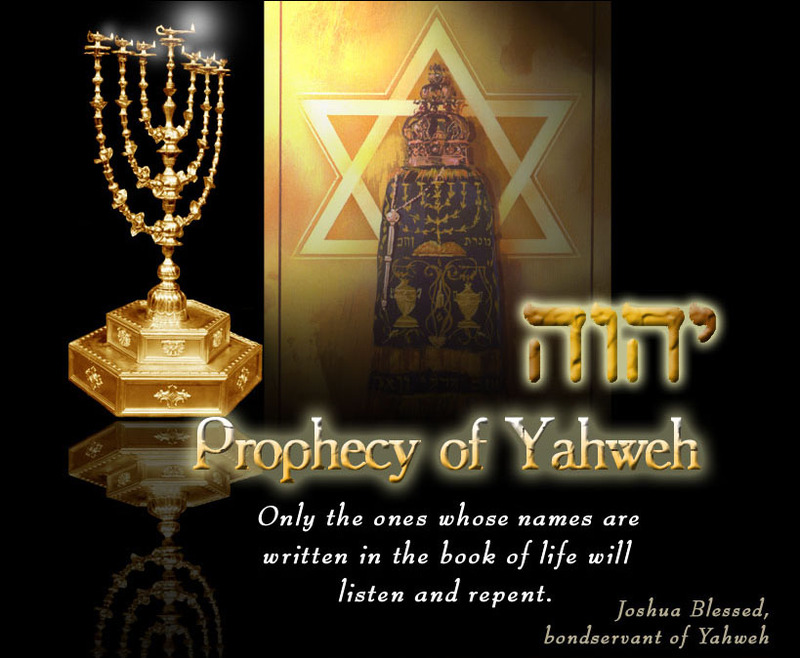 Joh_4:24 El יהוה / Yahweh (God) is a Spirit: and they that worship Him must worship Him in spirit and in truth. 14:17 Even the Spirit of truth; whom the world cannot receive, because it seeth him not, neither knoweth him: but ye know him; for he dwelleth with you, and shall be in you. 16:13 Howbeit when he, the Spirit of truth, is come, he will guide you into all truth: for he shall not speak of himself; but whatsoever he shall hear, that shall he speak: and he will shew you things to come. Luk_11:13 If ye then, being evil, know how to give good gifts unto your children: how much more shall your heavenly Father give the Holy Spirit to them that ask him? Act_2:4 And they were all filled with the Holy Ghost, and began to speak with other tongues, as the Spirit gave them utterance. 2:38 Then Peter said unto them, Repent, and be baptized every one of you in the name of יהושע /Yahshua the Messiah for the remission of sins, and ye shall receive the gift of the Holy Ghost. 2:39 For the promise is unto you, and to your children, and to all that are afar off, even as many as יהוה / Yahweh our Elohim shall call. Act_5:32 And we are His witnesses of these things; and so is also the Holy Ghost, whom El יהוה / Yahweh hath given to them that obey Him. Rom_8:4 That the righteousness of the Torah (law) might be fulfilled in us, who walk not after the flesh, but after the Spirit. 8:5 For they that are after the flesh do mind the things of the flesh; but they that are after the Spirit the things of the Spirit. 8:9 But ye are not in the flesh, but in the Spirit, if so be that the Spirit of El יהוה / Yahweh (God) dwell in you. Now if any man have not the Spirit of the Messiah, he is none of His. 8:10 And if the Messiah be in you, the body is dead for sin; but the Spirit is life for righteousness. 8:13 For if ye live after the flesh, ye shall die: but if ye through the Spirit do mortify the deeds of the body, ye shall live. 8:14 For as many as are led by the Spirit of El יהוה / Yahweh (God), they are the sons of El יהוה / Yahweh (God). 8:26 Likewise the Spirit also helpeth our infirmities: for we know not what we should pray for as we ought: but the Spirit itself maketh intercession for us with groanings which cannot be uttered. 8:27 And he that searcheth the hearts knoweth what is the mind of the Spirit, because he maketh intercession for the saints according to the will of El יהוה / Yahweh (God). 1Co_2:10 But El יהוה / Yahweh (God) hath revealed them unto us by His Spirit: for the Spirit searcheth all things, yea, the deep things of El יהוה / Yahweh (God). 2:14 But the natural man receiveth not the things of the Spirit of El יהוה / Yahweh (God): for they are foolishness unto him: neither can he know them, because they are spiritually discerned. 14:2 For he that speaketh in an unknown tongue speaketh not unto men, but unto El יהוה / Yahweh (God): for no man understandeth him; howbeit in the spirit he speaketh mysteries. Gal_4:29 But as then he that was born after the flesh persecuted him that was born after the Spirit, even so it is now. 5:16 This I say then, Walk in the Spirit, and ye shall not fulfil the lust of the flesh.